Even if blockchain technology must still overcome some challenges, there has recently been a clear change in the attitudes and initiatives regarding the technology behind cryptocurrencies. Moreover, the use cases and spending patterns have become more defined, showing more clearly how blockchain is converging not only with the Internet of Things (IoT), but also with the foundations of a digital economy (this latter based on the trend of governments investing in blockchain programs and projects). On the first of February 2018, the European Commission launched the EU Blockchain Observatory and Forum, and announced that they will fund projects up until 2020. Estimates indicate that the Commission will fund projects that could draw on blockchain technologies for up to €340 million. While the future of cryptocurrencies remains uncertain and some initiatives—such as Kodak’s recent cryptocurrency move—ride on waves of hype, several new blockchain initiatives prove that a wide range of organizations, industries, and policymakers across the globe take the development of this technology seriously. At the end of 2017, for example, the U.S. government awarded $750k to a blockchain startup. The Australian government, meanwhile, granted nearly $6 million to a blockchain-powered utility project in the City of Fremantle. Blockchain technology was also one of the hot topics discussed during the World Economic Forum 2018, where the relevance of this technology became increasingly clear as initiatives from governments and government bodies strove to drive the blockchain adoption agenda. In the meantime, new consortiums and partnerships between major companies across several industries highlight the almost natural link between blockchain and the Internet of Things. I recently had the opportunity to speak with Don Tapscott, one of the world’s leading authorities on the impact of technology on business and society, and, according to Thinkers50, the second most influential management thinker in the world. Tapscott kindly agreed to share his insightful observations and predictions about how blockchain and IoT are poised to contribute collaboratively to the transformation of several applications and even entire industries. This is a topic I had begun exploring in a February blog post about the interconnected roles of blockchain, IoT, and the combination of the two in the scope of disruptive technologies. IoT is a powerful technology that enables us to build a bridge between the digital and physical worlds. But, without blockchain, IoT technologies face scalability and peer-to-peer issues. Blockchain will serve as the backbone of digital trust and security for interactions, which is exactly what is happening at an ever-larger and soon-to-be-massive scale in IoT applications. As I wrote in a guest blog for IoT Business News, blockchain technology, often combined with AI, doesn’t just promise to be the missing link enabling peer-to-peer contractual behavior without requiring any third party to “certify” the IoT transaction. It also answers the challenge of scalability, single point of failure, time stamping, record, privacy, trust and reliability in a very consistent way. First and foremost, the convergence of IoT and blockchain is tested, analyzed, and deployed from a security perspective. If you look at IoT security today, solutions often revolve around identity management and encryption. Needless to say, encryption and cryptography are the very essences of blockchain technology. Moreover, blockchain is thoroughly reviewed and tested for identity management solutions. Secondly, there are many use cases in which both IoT and blockchain are poised to play a critical role. Smart contracts, for example, will undoubtedly play a key role in IoT and data exchanges. Supply chains and track-and-trace products are not only ranking high on the lists of IoT spending priorities, they are also excellent examples of use cases for blockchain. Finally, the relevance of how blockchain can be used to improve the transfer of value and information needs no additional explanation in an IoT context. Thirdly, there is the usage of IoT within blockchains. At some point, blockchain-distributed ledgers will incorporate IoT sensors, and as transaction latency becomes critical, network connectivity and computing power within the IoT infrastructure will become a core component of the blockchain environment. The question is not if IoT and blockchain will change the face of an industry, but how they will do so and via which use cases. To enable far broader adoption, beginning with the main use cases, Blockchain will provide the needed trust, security, authentication, and standardization across different parts of IoT and the transactional layer of the IoT ecosystem. From the perspective of facility management, building automation, and energy management, many of these use cases are highly relevant, including end-user authentication, IoT network management, energy transmission and bartering, diagnostics, data transmission, and so forth. Attitudes are changing and policymakers are preparing to boost their digital economies by investing in blockchain. In addition to the recent EU blockchain initiative, other countries and regions have already started to get more proactive about this technology, including the United States, which ranks higher than Western Europe when it comes to blockchain investments. In a further sign of what’s to come, the U.S. National Institute of Standards and Technology, an agency of the United States Department of Commerce with the mission to promote U.S. innovation and industrial competitiveness, has released a blockchain draft report. This is the year to investigate the possibilities. In a few years, blockchain will be the backbone of digital trust for many large organizations. The 5 Elements: What could be the future, and what will come next? To build cyber-physical systems that allow us to derive the insights we need to cross the bridges between digital, physical, and human intelligence and innovation, we need to first be able to connect objects. The first layers of the IoT technology stack are essential to enable over-the-air car updates, build autonomous vehicles, and transform from the edge. This essential space of tiny sensors, protocols, embedded intelligence, data capture, APIs, and communication is the cornerstone of the new possibilities and opportunities empowering people and entrepreneurs. The Internet of Things is just the “byte” of the next internet; it will enable a scalable and nearly infinite source of raw data for Deep Artificial Intelligence. As we’ve established, without blockchain IoT is forced to contend with scalability and peer-to-peer issues. Not everything is driven solely by technology. Human decisions, agreements, and cooperation are equally essential to transform at scale, and all of those interactions rely heavily on being able to establish trust and facilitate secure transactions. However, even in relation to the human component, it’s a disruptive technology that enables these conversations and transactions in a digital context. Blockchain will serve as the backbone of digital trust, providing security at interactions on a massive scale. Security and trust, in fact, are also horizontal layers of the IoT stack. Without them, nothing is possible. Yet trust is also needed to enable collaboration, ecosystems, data exchanges, and connected platforms across companies and industries that aim to transform. At the core of each IoT interaction and transaction—transformation, data, connected objects, autonomous devices, and exchanges of mutually enriching ideas—sits the need for trust, embedded at scale. That is the true disruptive power of blockchain. Once you have securely connected things and people in a peer-to-peer infrastructure, you end up with a massive source of raw data. IoT platforms, application enablement software, and software applications overall enable us to combine and understand data, extract intelligence, and unleash advanced analytics in ever-growing volumes. Today, we only use a small percentage of all the data we have. The majority of our data sits and waits for the next brilliant mind, innovative idea, or transformative use case in which it would make sense. Software penetrates on all levels; it connects, translates, detects, visualizes, and enables this environment so that our human intelligence is enriched with a flow of actionable data intelligence that vastly improves our decision-making capacities. The next step will be artificial intelligence using the big data enabled by the first three elements. Artificial intelligence does not replace human intelligence; it augments human intelligence in an effort to benefit humanity. Artificial intelligence is how we make sense of unstructured data and turn it into intelligence from which we can create innovation and transformation. From improving quality of life (such as, for example, effectively managing smart buildings) to solving societal challenges (such as environmental issues) AI can be a game-changer. As the volumes of data keep growing, so does our digital footprint and capabilities in business. To paraphrase Cisco CEO, John Chambers, the speed of disruption is getting brutal and we must keep reinventing ourselves, there is more need for artificial intelligence, advanced analytics, and other disruptive technologies at true scale. Quantum computing will not only force us to reinvent ourselves again, it will also provide the catalyst for unprecedented inventions and innovations. Nicolas Windpassinger is the Global Vice President of Schneider Electric’s EcoXpert Partner Program, whose mission is to connect the technologies and expertise of the world’s leading technology providers, pioneer the future of intelligent buildings and the Internet of Things, and deliver smarter, integrated, and more efficient services and solutions to customers. 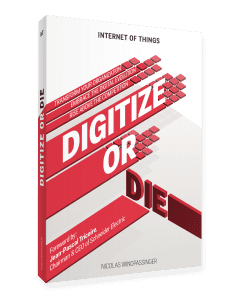 Nicolas is also the author of Digitize or Die used by front-line business decision makers to digitize their strategy, portfolio, business model, and organizations. This book describes what the IoT is, its impacts and consequences, as well as how to leverage the digital transformation to your benefit. The post Blockchain and the IoT: 2 of the 5 elements that will change your world appeared first on Schneider Electric Blog.